The impact of automated parking garages? Based on the previous blog, Modern Parking 101, the urban parking garage as we know it will eventually be gone – thankfully. How will this affect cities as a whole, and ultimately your quality of life? – At the image shows, now that you have three times more space for people than cars, that’s a lot more space to build cool lofts, workplaces and retail venues, and a greater supply means more reasonable prices. It’s also an opportunity to build better schools for the increasing urban populations. An increase in residents means safer streets at night, while more daytime workers adds to job growth. – What about the adverse effect of possibly having three times more cars? Urbanists understand that city parking is a privilege rather than a right (opposite of what it is in the ‘burbs). 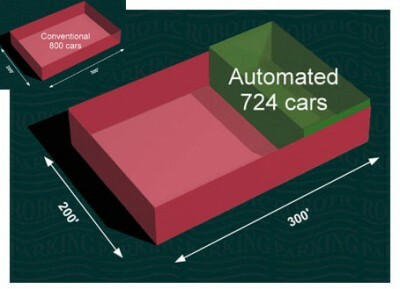 The benefits to the city’s economy and quality of life justify these highly efficient parking systems, even though the cost per parking space is about twice that of parking garages. The good news is there are more and more people who either don’t need that car (especially with the all added amenities described in the previous paragraph), or are willing to pay the price to ‘have it all’.